This was my project for Round 2 of One Month To Win It’s craft competition. Now that the voting is over I can share it with you. The challenge was to do something that involved Mod Podge. For this task, I Mod Podged an old wooden chair that had been in our backyard for years. If memory serves, the previous owners left it here. This chair was a mess, but I’d been hanging onto it because it had nice lines. Our dog chewed on it. I asked her about it, but she just gave me a guilty smile and invoked her 5th Amendment right to not incriminate herself. The chair was kind of rough and rickety (1) and while our dog had actually chewed a little bit all over the chair, she really took big chunks out of it on the front slat on the seat(2). With a whole lot of spackle, I filled holes and basically created a whole new seat slat. The chair was sanded, primed, and the edges were sprayed with an apple green paint. (3) I then hand mixed acrylic paints to get the exact shade of green to match my fabric. The chair was painted with that. It took several attempts to get the paint and the wash just right. After all that careful mixing and painting, I cannot get the camera and lighting right so that the color of the chair comes out in the photos. I’m pretty pleased with how it turned out. It is certainly better that it was as the dog’s chew toy! 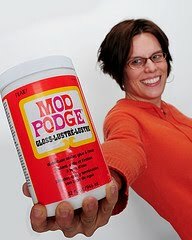 For real Mod Podge tutorials from a genius, go and visit this lady…. Amy from Mod Podge Rocks knows this stuff backwards and forwards and you’ll be amazed by some of the things she has created. That looks great! And I can just “visualize” the apple green colors – I know it is beautiful! I had to chuckle about the dog – I have one that will chew on anything. Glad to know sometimes you can repair their damage! Looks fab!! I’m so glad you and Mod Podge worked out some of your issues. SWEET! The chair turned out great. I understand the color and camera issues. Good luck this week! Wow I love Mod Podge but would not have thought to use it on a chair. Two questions: How much Mod Podge did it take and what happens if it gets wet? did you use an acrylic sealer or anything on it? Thanks for posting! 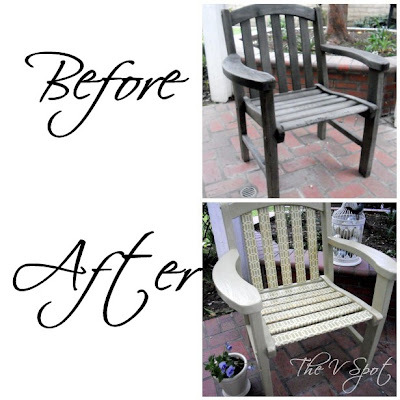 Wow such a great makeover for your lawn chair ! Oh ModePoge.. such a fickle mistress she is… so glad you got it all right for such a wonderful project. I just bought my very first bottle of Mod Podge today…I can only hope my projects turn out as great as this one!! I love it! WOW!! That looks fantastic!! I have GOT TO try Modge Podge! Thanks for sharing your project. It really looks great!!! I’ve used it to cover an old thrift store find desk with a world map (one of the old nat geo mag ones) it looks much more interesting now. Nice Job girlie! I wish I could see the apple green too- it sounds so fresh and springey!!! I love the chair! It turned out beautifully!! I have a chair that could use this kind of treatment!! Mod Podge huh? Well I will have to give it a try. Wonder how it will weather??? What a great idea! I wouldn’t have thought to a) use modge podge with fabric (I’ve only used it with paper) and b) to modge podge a chair. This turned out lovely! This looks great! Definitely gave me inspiration for future projects! MOD PODGE IS THE BEST. love the chair re-fab. it looks amazing, way to go. I knew that was your project!! Wow! What a great makeover! I would love for you to come link up to my Sew Crafty Party ! This looks great! I love the pattern placement! Luuuuv it! I have a chair that could use that makeover! beautiful! the pattern is great. Looks outstanding!!! Thanks for sharing her makeover at my NIFTY THRIFTY TUESDAYS PARTY!!! I am blown away by this chair, just so awesome!! Brilliant job on this. I found your link on At Home With K. Love it! You did an amazing job on it! You are so creative! that looks awesome, vivienne! what a great save! Too sweet!! The fabric accents make that chair. So keep that darn dog away from it now, ok? As always… Love your stuff! It looks wonderful. I LOVE this! I totally voted for it! Thanks for the inspiration! Another wonderful creation! 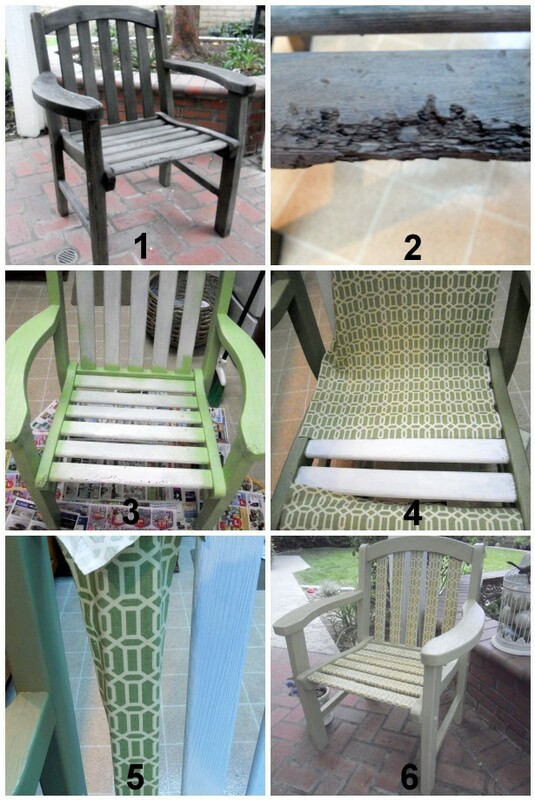 Who would of thought to do mod podge magic to a chair? You of course! Great job! Thanks so much for linking up to Terrific Under Ten today! love love love it! this chairs is awesome. thanks for partying at Type A! This is lovely. Hope to see you at My Dream Canvas! Have a great day. Another AMAZING project!!! Is there anything you can’t do? Thanks for sharing your great chair at the Tuesday To Do Party! That looks amazing. I love your post…you are so funny. Thanks for sharing at my Swing into Spring party. Very pretty! What a great makeover! I would love for you to come by and link up to Inspire Me Monday. It’s up all week! So Cute!!! I would love it if you would come and link this up at our What I Made Wednesday linky party! That turned out great!! Is it waterproof? Wow! Your chair looks amazing! 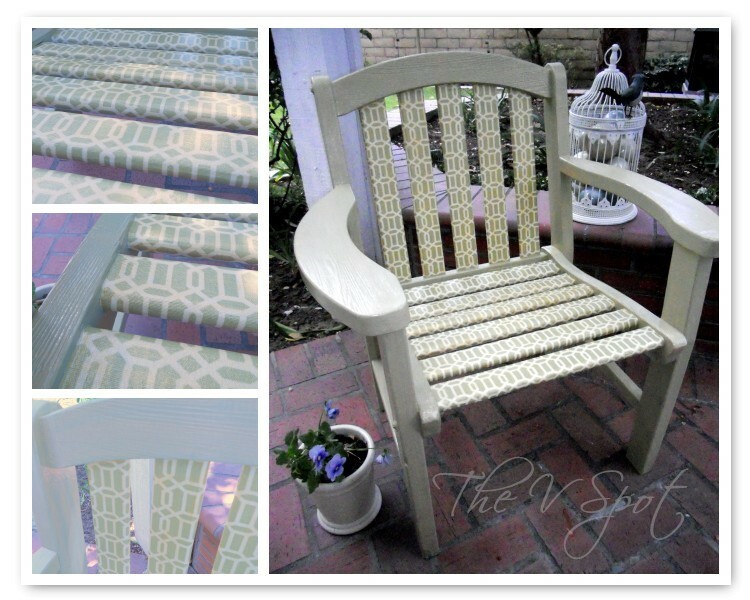 In your picture the soft apple green paint and the fabric are such a good match that it looks like the chair has been perfectly stenciled. I hope you’ve had a chance to sit down and relax in it! This looks great. I never thought of mod podging a chair. What a great idea! Very pretty!! Love the detail you put into it. Thanks for linking up to Your Whims Wednesday! What a pretty look for your chair! I just used some Mod Podge on a tea card and love the look! Visiting from Tickled Pink Party. That looks great! How did you seal it? Is it protected from the elements? Popped in from Tickled Pink- this is an awesome revamp! Did you use regular Modge Podge or the outdoor ‘Podge? Well done, I think I need to add modge podge to my list!Happy Friday,Happy Good Friday, Happy Earth Day, Happy Jelly Bean Day ( yes it’s actually jelly bean day)Hugs from Katherine. P.S have you entered my giveaway? Great idea! Do you know how well Mod Podge holds up in the outdoors? I have never tried it. That is a pretty awesome makeover! Love what Mod Podge can do! love this chair! saw your cork project on the challenge too, how fun! i love that stuff. it works wonders! and your chair is too cute! This looks great! Oh, I love Mod Podge. I haven’t been using it (at least not well) for very long now, but I’m definitely hooked on the stuff. I don’t think I ever would have thought to Mod Podge this kid of chair, though. The results are pretty spectacular! dont you just loveeeee Mod Podge!! love the chair and love your choice of the apple sage green and cream fabric! Im blog hopping from homemakeronadime Creative Bloggers’ and Hop! What a great idea…Love Mod Podge!!! I love it! It looks so fantastic and I’m glad the 2 of you (you and miss Mod) didn’t need to go into counseling or anything. LOL! Thanks so much for sharing this last weekend at Inspiration Friday! Love this! You did a wonderful job! Mod podge is seriously so great! 🙂 Thanks for sharing! This is beautiful! Thanks for sharing it at Fantastic Friday! Ok, I would never, ever have thought to modge podge fabric to a chair… it looks awesome. Oh my goodness I love this so much! Awesome, awesome job!!! love this! thanks for linking it up to our party. I have dining room chairs that one of my pets (a dog) from a while back (too long – 20 years) chewed on. Maybe I should think about doing something similar! I know the fabric from JoAnne’s that you used! It is one that I’ve had my eye on sincde I found it on an ETSY website for fabric. Good choice. Love this!! You have the amazing ability to make everything beautiful. Love it!! Thanks so much for your support and posting about my linky party!! That chair is stylish and functional 🙂 Really appreciate you sharing this great post with us at the Creative Bloggers’ Party & Hop. Looks great! I have several chairs that have just barely survived our dog’s chewing days. I’ll have to Spackle them up… thanks for the inspiration. Wow! What a fabulous idea! It looks so fabulous now! Thanks so much for linking up! I’ll be featuring it. Great job – that looks awesome! Gotta love that stuff….you can do so many nice things with it. The chair looks great! girlfriend…you are EVERYWHERE!! dont know how you do it!! great project! thanks for linking up! we featured your chair this week! Your chair turned out so beautifully! I love the color choice too. I love what you did to the chair. You have a great eye you have added the decorative paper the way you did. This is on fabulous DIY. 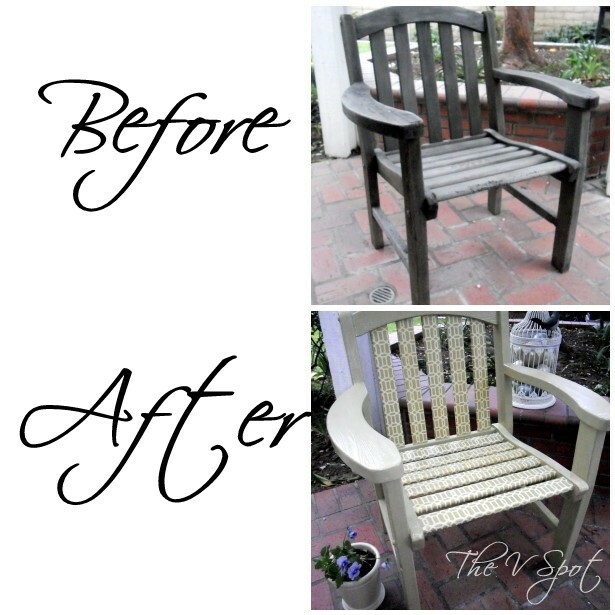 Wow I love what you did to that chair!